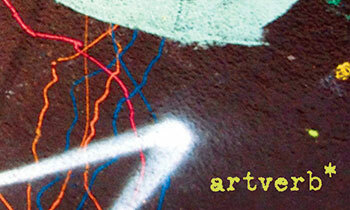 artverb* is an independent artist-run business dedicated to serving the needs of Toronto’s visual arts community. We are based in downtown Toronto and cater to artists, galleries, museums and institutions. Ryan makes artverb* awesome. This company is his vision. He tells everyone what to do. He likes being green. He also likes cookies. Some people know him as the mousetrap artist. Some people know him as an ultra runner. And some people know him as the boss. If you need to book a job with us, you need to speak with Agata. She answers our phones, takes care of our local and international logistics, and makes sure our clients are happy. And when not in front of the computer, she sits in front of her antique typewriter and makes art. At six and a half feet tall, Dave is the tallest member of the team to date. Working with some of the city’s top galleries and artists, Dave has installed dozens of exhibitions over the past three years. We are very happy to have him on board. Dean is just a normal guy who likes movies and watching the waves lap upon the sand as the sea birds circle above waiting to scoop up the stardust falling from his gleaming hair. We’re not really sure what makes him such a nice guy but we’re pretty sure it has absolutely nothing to do with how incredibly handsome he is, or the fact that he was born in Oshawa, ON. In addition to installing and handling art, Brandon is an Artist and Illustrator whose work has once been used to advertise microwave pizza products to teens and young adults much like himself. Maxwell is an artist and illustrator who exhibits his multiples regularly at artist-run centres, art book, and zine fairs around Toronto. In addition to art handling and installation his experience includes working on installations and window displays for Urban Outfitters and a brief stint as the art director for a University of Toronto Newspaper. Born into a military family, Miller grew up across Canada in various locations including Ontario, Alberta, and Vancouver Island, BC. He attended Post Secondary School at Georgian College (Barrie, Ontario) in the Fine Arts Advanced Program under the direction of accomplished artists such as Stu Oxley and Ted Fullerton. Influenced by the Group of Seven, Automatist, Giacometti, Chagall, and the Graffiti/Street Art Movement, Miller produces vibrant, highly textural and intricate pieces that comment on urbanization, materialism, and North American culture. The menacing robot juxtaposed to his unique graffiti visuals state society’s dependence upon technology within an evolving cityscape. 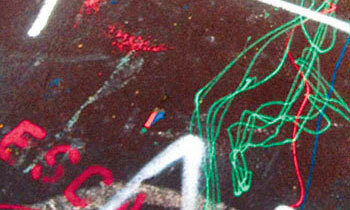 Currently residing in Toronto, Miller practices Mural work along with Acrylic/Spray paint on canvas and wood panels. Working in the transportation industry for almost twenty years, Steven has developed his skills in both short and long haul logistics. His experience in extreme Northern climates comes in handy during winter trips, and he values a really good latte on early morning starts. Of all the cargo he’s ever transported, he thoroughly enjoys transporting art the most. Steven’s attention to the specific needs of cultural objects in transit has been his top priority and passion. When not behind the wheel, Steven enjoys sketching and painting and upping his culinary skills with cooking adventures (new tool: 2700K kitchen torch). Winters are spent growing vegetable seedlings and summers are reserved for nurturing those now-burgeoning vegetable crops. Fishing and classic video gaming round things out. Nick’s experience includes fabricating and installing window displays to fine art installations all over Manhattan- from galleries and auction houses to local art fairs and Miami basel. Nick is a painter, sculptor, and also creates custom footwear. In all things he does Nick likes to bring a detail-oriented creative approach, whether it’s installing a show or discussing ufo conspiracy theories. Stephen Deffet is an artist currently living and working in Brooklyn, New York. Stephen has shown his work internationally and directed an artist-run gallery out of his garage for two years while living in Ohio. When Stephen is not at the studio or working one of his art handling jobs he is most likely eating or sleeping. Todd handles art on our Chicago shuttles. He is also a fine art printmaker and maker of zines and small publications. Otherwise he is drinking coffee at Chicago diners or hanging out with his dog Laika and cat Hot Sauce. He is a 31 year old lovingly restored Grumman Kurbmaster. Herb is our #1, and the original truck that started it all. He has a 6′ 1/2 x 7′ x 15′ double padded carpeted cargo area. Herb is now mainly used locally in Toronto and on special occasions including parades and parties. full alarm system, and lift gate. He is used locally in Toronto, but also southern Ontario, Quebec and other out-of-town jobs. Hiro is a 2016 Hino 195 20ft truck with the best climate control, air-ride suspension, full alarm system including GPS TRACKING and lift gate. He is the bigger and tougher brother of Yoshi. Inside he is designed to an international art shipping spec never before done in Canada. This is the truck that offers the absolute best environment for temperature sensitive and high value artwork.